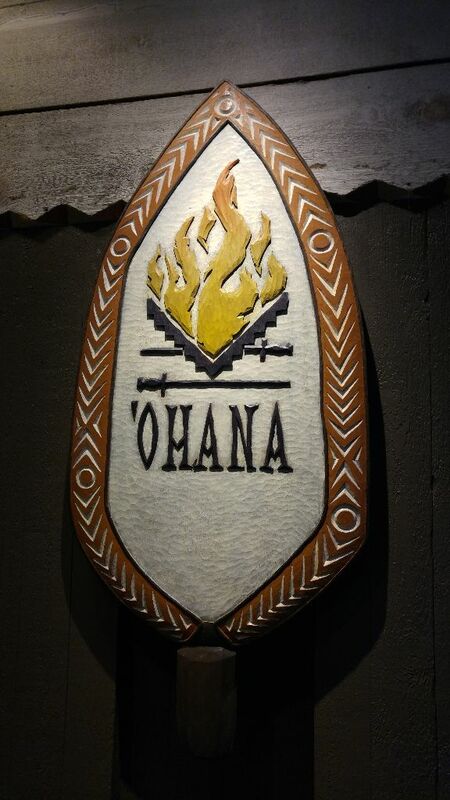 We recently made it out to Disney’s Polynesian Village Resort for dinner and what better place to eat than ‘Ohana? Located on the second floor of the Great Ceremonial House, ‘Ohana is billed as Hawaiian-style feast and it certainly doesn’t disappoint! If you have an early enough reservation you’ll be able to catch a quick opening song welcoming you to ‘Ohana and the feast that awaits. On your way to the table you’ll make a quick stop to pick up some Pineapple-Coconut Bread and peek at the meats cooking. 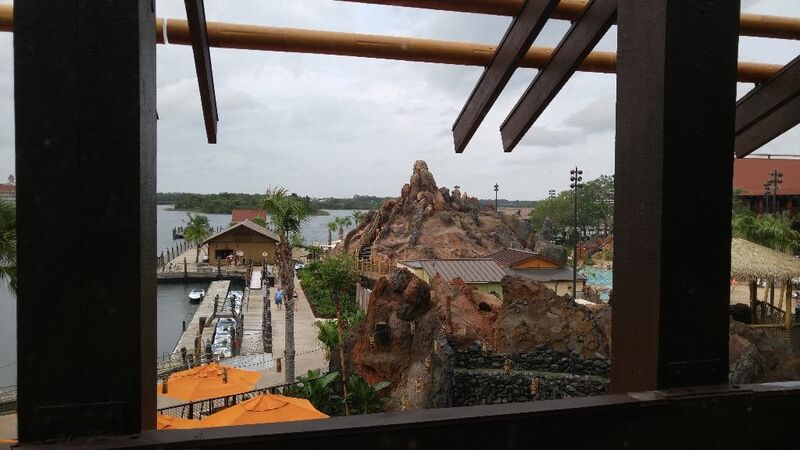 If you’re a party of 4 or less I would suggest requesting a window seat as you get a nice view of the resort pool area and Seven Seas Lagoon. 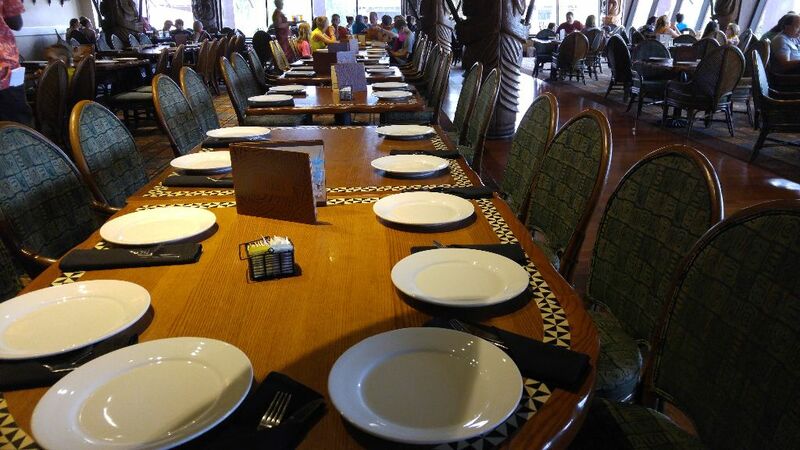 Larger parties are going to be seated at some of the tables located in the middle of the restaurant. That said, there are nice, panoramic views to be had from most tables. As a party of two in the first dining period, our request for a window seat was easily accommodated. Here’s a highly questionable panorama from our seats. The key to ‘Ohana is to pace yourself. 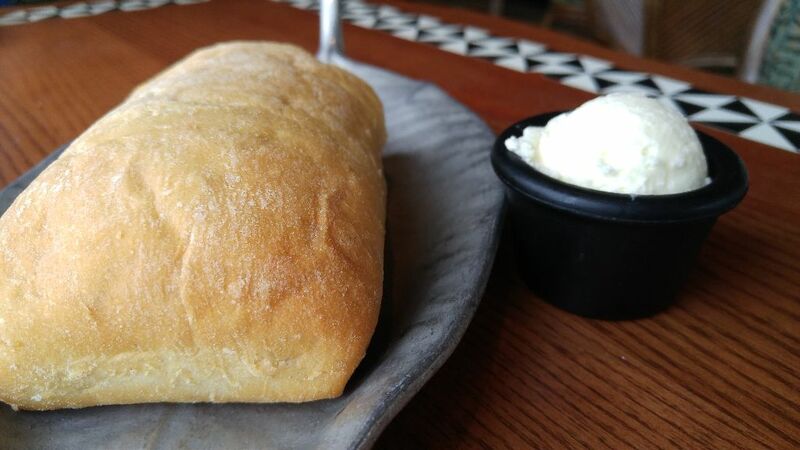 The bread, while great, is meant to distract and fill. 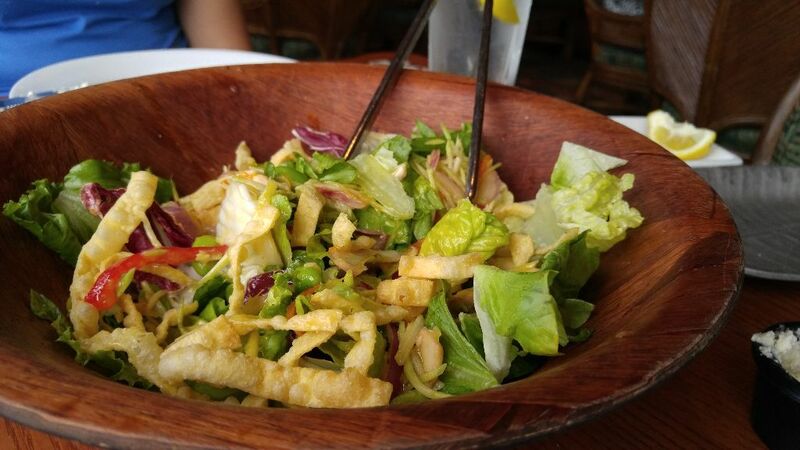 You’ll also get a salad with a nice Lilikoi dressing. While I’m a ranch dressing sort of guy, this is a very nice vinaigrette that makes for a good salad. Next up was a nice helping of noodles, tossed in a Teriyaki sauce with fresh veggies. Probably the best noodles I’ve had on property, maybe ever. 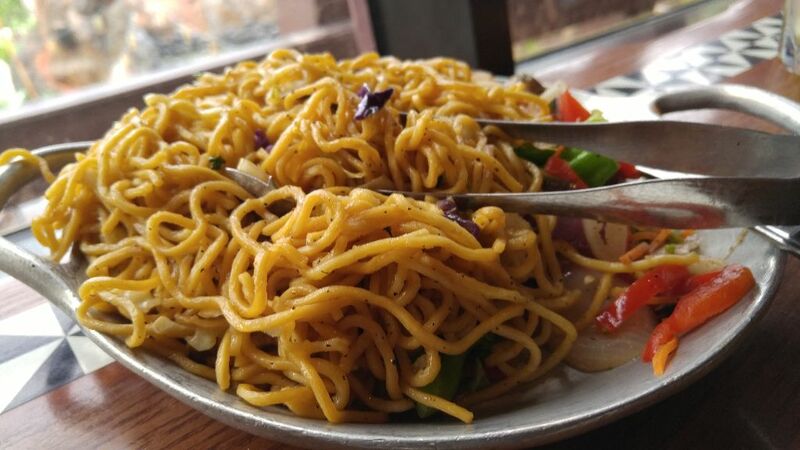 As always, your mileage may vary, but I’ve never had a bad serving of these noodles. The appetizers are where I consistently stray from the ‘pace yourself’ strategy. The wings are good, but the real reason I will “review” ‘Ohana until I die are the pork dumplings. 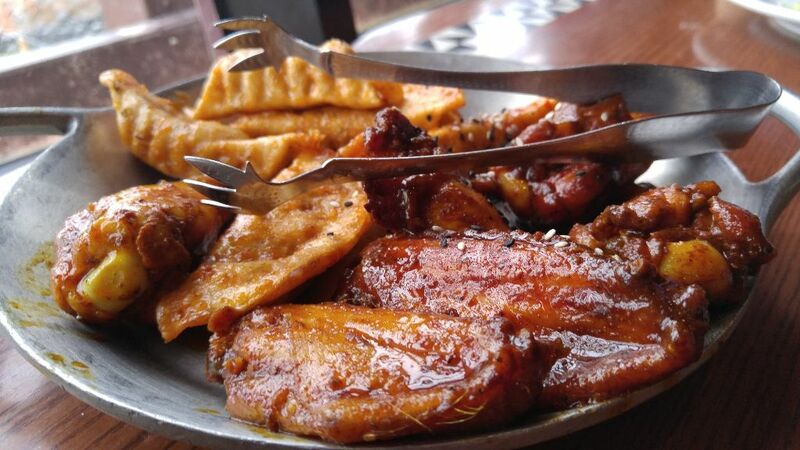 The appetizers come with peanut and Sweet-n-Sour sauces. Both are delicious, but I tend to pair the dumplings with the Sweet-n-Sour more often than not. 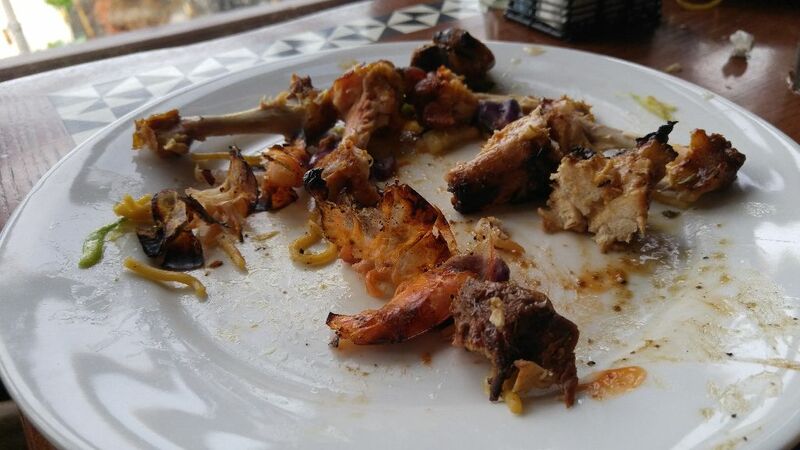 If you’ve made it this far in your meal (and this blog post) you’ve finally made it to the main course. 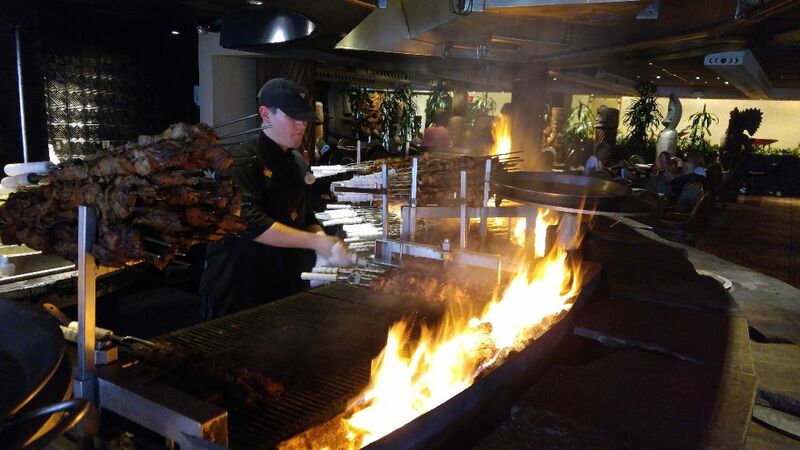 The same meat skewers that you passed on your way to your table are now just as ready for you, as you are for them. The online menu will describe them better than I can (mainly because I’m thinking about booking a return visit to ‘Ohana as I type this). 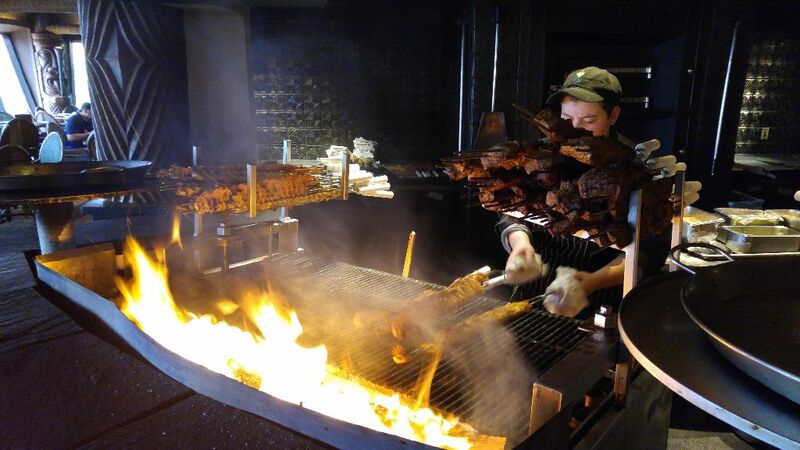 Your waiter or waitress will come over with a long skewer of each of the meats one at a time. I usually go with two of whatever meat is brought over to ensure I can get through them all and then request more if I want it. 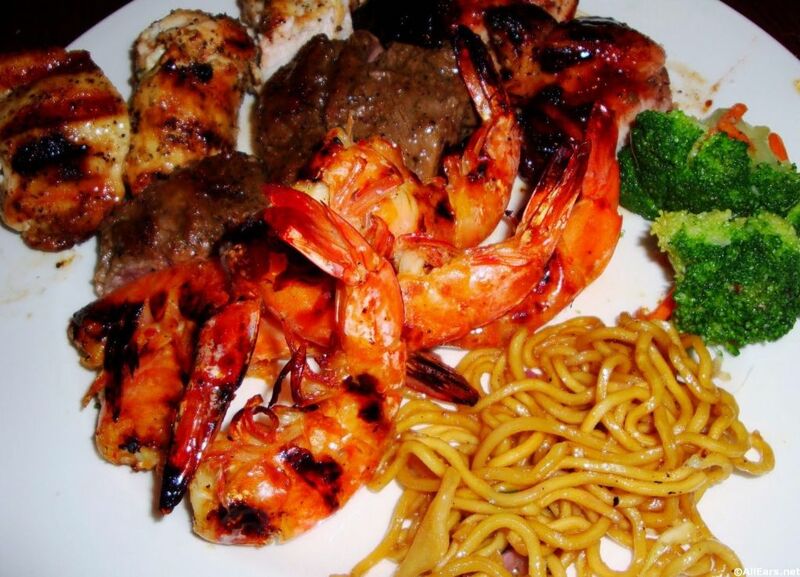 Here’s a picture from AllEars.net of the chicken, steak, and shrimp (I was too busy eating to grab a picture). As I said earlier, the key to ‘Ohana is to pace yourself. All you can ask of yourself at this point is that you’ve left a little room for dessert. 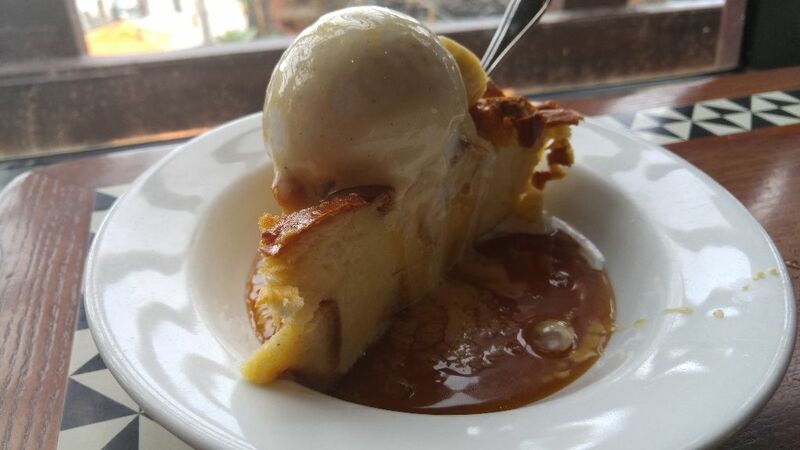 The bread pudding with Bananas-Caramel sauce, when done right, can bring grown men to tears. I did have one experience where it was a bit dried out, but that was at the end of the night and I wrote it off as every other trip has been great. So, that’s ‘Ohana! Along with a great meal are some fun games for the kids where they can sweep a coconut around the room in a friendly race. Also, you can catch Wishes from the restaurant if you time your meal properly. A lot of guests from the second seating will try their best to stretch their meal from 7-8pm right up to Wishes at 9 or 10. I would love to be able to suggest the third seating period for a Wishes viewing, but an 8pm reservation might serve you best as tables turn over very slowly 30-45 minutes before Wishes. The Wishes soundtrack is piped into the restaurant for your viewing, and listening, pleasure. As always, if you’re having trouble getting into ‘Ohana or any restaurant on Walt Disney World Resort property, give WDWTableFinder.com a look. It will watch for open tables 24/7 and alert you when a reservation opens up. Have any questions? Leave a comment below or reach out to us at @SpotMickey or facebook.com/WDWTableFinder.